Designers know the bathroom mirror can be so much more than utilitarian. When done correctly, mirrors boost natural light and perceived space. But selecting a mirror isn’t a one-size-fits all solution. The shape, size, and style influence a designer’s mirror decision. Your bathroom mirror must work with the space, as it will literally reflect the surrounding walls. 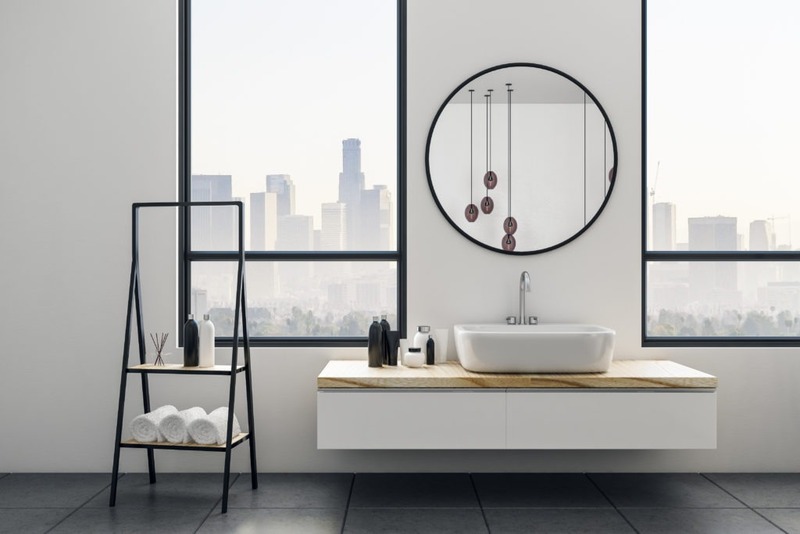 So, unless you’re planning on making a major renovation, follow these insider tips to select the best mirror for your bathroom. Vanities vary from wide dual sinks to dainty pedestal styles, and so should the accompanying mirrors. For example, the prominent structure of a dual sink vanity with ample storage needs a rectangular mirror to balance while an oval or round mirror is best suited for a curved pedestal sink. Dual vanities can support up to two thinly framed or fully unframed mirrors, just be sure to leave a gap of a few inches between. Pedestal sinks, on the other hand, do best with one curved mirror. Work with your windows & the walls. Some bathrooms are blessed with spacious walls and sun-filled windows. If this sounds like your space, make sure your mirror is positioned to support the room’s natural light without overdoing it. A few tall mirrors placed catty-corner to your window can work wonders. When you’re stuck with a small window, opt for a larger sized mirror and place it directly opposite of the window to increase the natural light of your bathroom. A good rule of thumb: The less light and the larger the wall…go big. The more light and the less square footage…stay small. Get down to the details. 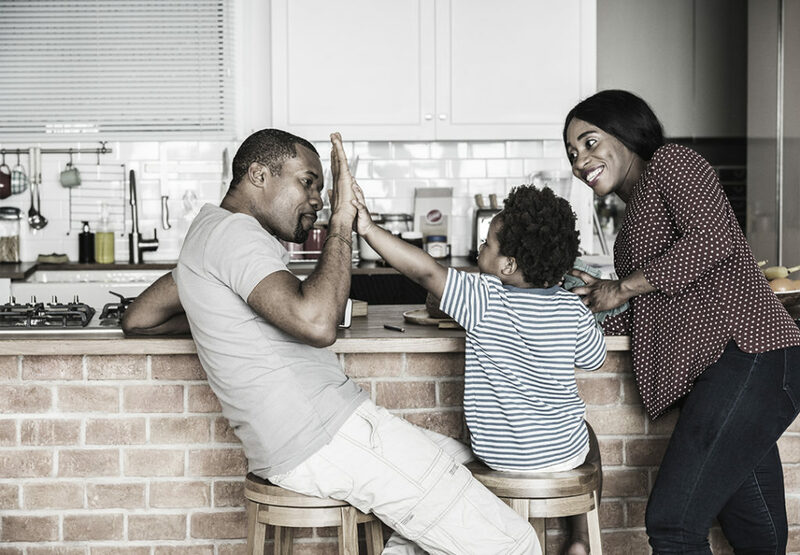 With our first two tips in mind, it’s time to make moves toward your new mirror. First, measure the vanity that the mirror will be installed above. With those measurements in mind, you’ll want to choose a mirror that is less than or equal to the size of your vanity, including the frame. It gets a bit awkward looking when the mirror dwarfs the vanity, so I recommend keeping about two to four inches of open space between the edge of the mirror and the edge of the vanity. Got kiddos? A six-inch space will help limit water stains. Next, measure the length of the wall up to any existing lighting that you plan to keep. You’ll want to utilize any space between to create the most visible height. But, if you want to surround your mirror with new sconces, find a mirror that is 60% your vanity size. Now, it’s time to add your own style. After all, your bathroom mirror is a reflection of you. Mirrors built into the wall create a lavish, modern look. Surrounding tiles or drywall create a perfectly minimalistic casing that will stand the test of time better than a trendy frame. This is an especially beneficial option for small bathrooms, as it creates an infinite effect while essentially doubling the visible space. When it comes to wide vanities, an endless line of tall mirrors can highlight the height of bathroom and effectively increase perceived space. 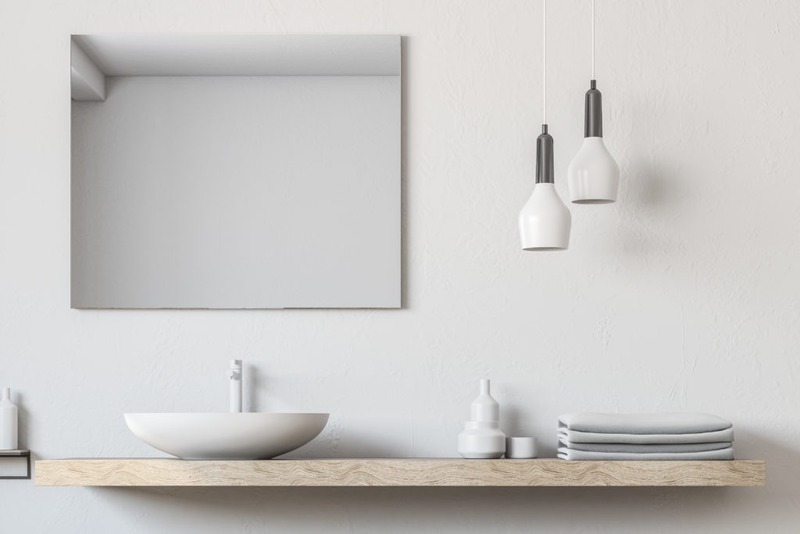 For the ultra minimalistic, suspended mirrors amplify light better without adding extra visible weight. Albeit beautiful, this style is not recommended for households with children. Keep grooming products and medicine right where you need it, without limiting square footage. This mirror style works well both above any type of sink, ranging from countertops with built-in cabinets and freestanding pedestal sinks. To guarantee your vision is feasible, mock up your mirror. Cut paper to your dimension of choice and tape to your soon-to-be-mirrored wall. This will help you see what it looks like if you position the mirror flush with the vanity or with a good amount of space, and help you decide if an alternative is necessary. Keep these tips in mind to select your bathroom mirror with an expert-like design eye. Then, we’d love to see what you come up with! Tag @Sinkology on Instagram with #showusyoursink.